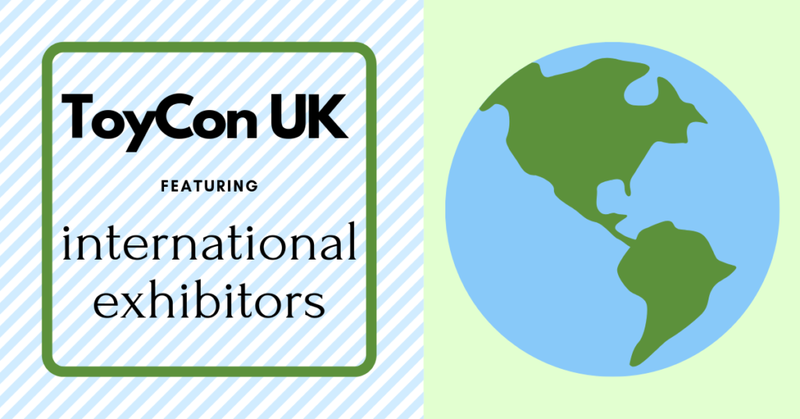 In my previous blog about ToyCon UK I covered exhibitors from Europe, the USA and Mexico. This blog features exhibitors who came all the way from Asia to show us their great work. Hariken brought a wide range of toys and encouraged everyone to take photos and explore his work. From MAD PANDAS, to BOX TURTLES, SOFTROLLs and tiny KOMESHINES, there were plenty of pieces to enjoy. If I had to choose I think the white SOFTROLL is my favourite (it makes me hungry haha), but the little KOMESHINES are really cool too. They had a nice weight to them and I like miniatures. Also, bonus points for Hariken for bringing so much positive energy to ToyCon. His smile was contagious. Next to Hariken you could find Sunguts. Unfortunately he had some bad luck with UK customs holding his package, but thankfully it was still possible to view his work and buy a few items. The big clear blue dragon definitely stood out sizewise, but the smaller characters had big personalities. I love the colourful quintuplets and the little guys sticking their tongues out. With all the different types of toys, Sunguts had something for everyone. Though Unbox Industries is located in the UK as well, I didn’t want to exclude them. One of the pieces I had to have was Ziqi’s dinosaur in the original T-Con colours. It’s so cute! Plus, you can never have too many dinosaur toys. Right O:)? Unbox also brought a lot of other cool toys including another one of my favourites: Jumbo Burger Elfie. It was hard to resist that one, but somehow I managed to walk away. I ended up at Code Corner BKK’s booth where you could find all kinds of art toys from different Asian designers. So many favourites there! A sassy alpaca, cool robots, Pokémon, a lovely pink elephant, cute cats. If only I lived in a castle where I could display them all… Unfortunately I don’t, but I’m glad I got to see all these toys in person and share all these wonderful pieces with you through my photos. ZazaToyBox was another booth that showed the work from different artists including Designer JT who brought several Zipitz with little lights in their zippable mouths. I always love art with electronical and moving parts so they definitely grabbed my attention. Designer JT, who is super kind and lovely to talk to btw, also made multiple designs for the ZazaToyBox Artist Series which included pieces ranging from cute and pink to darker designs. Jaykblu also showed his work at the ZazaToyBox booth and hosted a wonderful art show with his very own Ruffelz platform. Besides original red and blue Ruffelz you could also buy Ruffelz customs from artists like Zukaty Toys, David Stevenson and MJ Hsu. It’s always fun to see the different ways artists work with a platform and Ruffelz seems to bring out the best in everyone. It doesn’t end here though, because Cometdebris had a lot of cool exclusives and lucky bags to buy. My favourites include Kid-X and Ace Robo, two GID toys that have a pretty green glow to them and cute facial expressions. Gimme the glow! Last but not least is Litor’s Works who brought great designs like The Yoghurt Jellyfish and Rock Queen. Cuteness overload! I still don’t know how I managed to resist so many cool toys. It’s really great to see a mix of European, American and Asian art in the UK so I truly hope all our international friends will join us again next year. See you then? You can get your daily designer toy fix from our TTC Mobile App. It’s free too! FREE! Download it on iPhone or Android smartphones. Search for “The Toy Chronicle” and all your designer toy wishes will come true! Pretty much.